The Tucuman Parrot (Amazona tucumana), which is restricted to Southern Yungas forest of Argentina and Bolivia, has not recovered from severe population declines in the 1980s. We assessed habitat conservation targets for this species and asked, “What constitutes the right target?” For species with small ranges, maximizing the proportion of the range under protection is an established strategy to safeguard against threats. However, designating an amount for protection based on range alone (i.e. a ‘representation target') may set a misguided conservation target if critical resources are not considered. We used an ensemble model (‘biomod2’) to map suitable breeding and nonbreeding habitat of the Tucuman Parrot based on environmental variables and key resources (breeding) or the species' occurrence (nonbreeding). Pino blanco (Podocarpus parlatorei) seeds are critical food for Tucuman Parrot nestlings, so we modeled the distribution of this tree as a proxy for potential breeding habitat. We then examined the adequacy of current habitat protection relative to representation targets and in light of known threats, including forest degradation and loss, and poaching. Overall, 17% of the 110,122 km2Southern Yungas is protected, which is close to the proportion recommended (the target; 22%), based on the ecoregion's size, for inclusion in a conservation network. Similarly, 26% of the 46,263 km2 of nonbreeding habitat is protected, also relatively successful at 71% of the target (36%). However, of the scant ~21,000 km2of breeding habitat, only 15% is protected, much less than the representation target (49%) recommended for maximizing the probability of population persistence. Poaching of nestlings further undermines the value of some nesting habitat in Bolivia. For Tucuman Parrots, increased enforcement of protection in Bolivia and protection of additional nesting habitat in Argentina are the most efficient ways to enhance persistence. Our results illustrate how habitat conservation targets based on area alone may be inadequate if important biological information is overlooked. In mark–recapture studies conducted on fixed-area study sites, apparent (or “local”) survival (ϕ) is the product of the probabilities of true survival (S) and site fidelity to the sampling area (F). If marked individuals permanently emigrate from the study site, apparent survival will be biased low relative to true survival. Similarly, estimates of mate fidelity will be biased high because site fidelity is typically higher for individuals that reunite with their previous mates than among pairs that divorce. Here, we develop a method for calculating site fidelity that takes plot boundaries into account, based on a dispersal model estimated from local movements within a fixed study site. We use dispersal estimates to adjust apparent survival and mate fidelity for the effects of short-distance movements out of a fixed area. 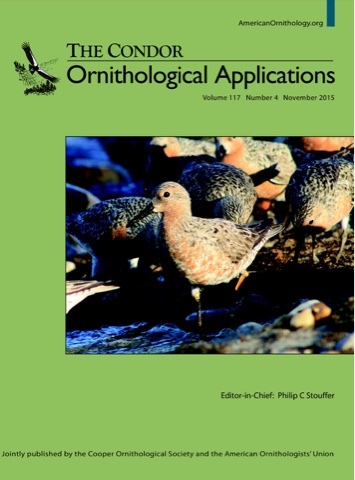 We demonstrate our method with a retrospective analysis of a published study of 2 species of sandpipers breeding sympatrically at a field site in western Alaska. Estimates of survival probability increased by 0.01–0.03 for males and 0.07–0.08 for females in both species. The larger adjustments for females were expected based on their longer local dispersal movements. Adjusted mate fidelity estimates were lower than the original estimates by 0.04–0.07. Use of local movement data to estimate site fidelity cannot account for permanent emigration due to long-distance movements and, if such movements occur, our adjusted estimates of ϕ remain a function of true survival and site fidelity. Nevertheless, our method can reduce bias in demographic parameters resulting from local dispersal movements, improving estimates of annual survival and mate fidelity for use in demographic models.